Bear Bouquets There are 23 products. Basic (As Shown)Teddy Bear Artificial Arrangement4 Stalks Artificial Rose, 2pcs Teddy Bear, Hydrangea & Other Fillers. Alternative materials may be used to ensure timely delivery. If so required, We will substitute material(s) with equal of greater value, while maintaining the quality and aesthetics of the final product. 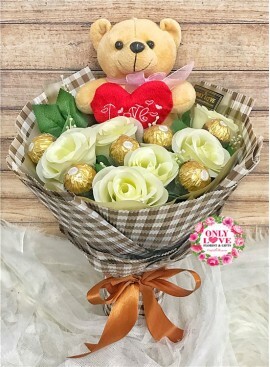 Basic (As Shown)Teddy Bear Artificial ArrangementTeddy Bear (38cm) Artificial Rose & Other Fillers. Alternative materials may be used to ensure timely delivery. If so required, We will substitute material(s) with equal of greater value, while maintaining the quality and aesthetics of the final product.